Carpenter ants are quite common in northeast Ohio especially in communities with lots of mature trees and extensive exterior landscaping. Carpenter ants forage and invade homes in search of food, moisture, warmth, and shelter. Carpenter ants are social insects, nesting in colonies which may be indoors or outdoors. A carpenter ant colony is started when winged reproductives (males and queens) swarm in the late spring or early summer. Mating takes place in flight. Shortly after, the male dies and the single fertilized queen ant finds a suitable nesting place to lay eggs and begin a new colony. The queen’s first set of eggs hatch into small workers. These small workers feed the queen and assist in expanding the nest. As more eggs are produced, the worker ants will vary in size from 1/4 to 5/8 inch in length. 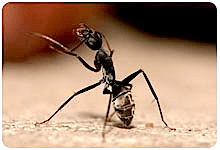 You may have observed different sized ants foraging about your home or yard. The larger (major) workers guard the nest, fight intruders, explore, and forage. The medium and minor workers carry out most of the work inside and outside the nest including excavating and caring for the eggs, larvae, and pupae and foraging for and bringing food and moisture back to the nest. It may take three to six years for a colony to grow to maturity with a population of 2000 to 3000 ants. As the colony grows it is common for the parent nest (which is usually located outdoors) to branch out and establish satellite colonies. Satellite colonies can be in the same tree or in a nearby structure, such as your house. The queen and the eggs remain in the parent colony. These satellite colonies will contain workers, older larvae, pupae, and when conditions are right, some winged reproductives. The workers of satellite colonies move readily between their nest and the parent colony. The carpenter ants inside a home may have originated from the parent colony or from one or more satellite nests. Carpenter ants are quite rugged and can tolerate severe environmental conditions including our sub-zero winters. Unlike termites, carpenter ants do not eat wood. It has no nutritional value to them. Carpenter ant workers forage outdoors for food such as honeydew (secreted by aphids), juices from ripe fruit, and other insects. Indoors they like sweets, meats, cake, grease, and moist kitchen refuse. Where Does the Sawdust Come From? Carpenter ants burrow or tunnel into the wood that has been softened, not to feed, but to expand an area for nesting. The occupied galleries are kept very clean. The excavated wood (called frass) resembles sawdust and is carried outside the nest and deposited (dumped) elsewhere. The discarded frass may be hidden behind a wall or it may appear as piles of wood shavings. Carpenter ants nest in voids. They may establish a nest in a naturally occurring void or they will excavate (hollow out) a space in wood that has been softened by moisture and wood rot. Outside, nests are typically located in old tree stumps, rotting fence posts, landscaping timbers, dead portions of standing trees, and under stones or fallen logs. Indoors, nests may be found in wall voids, under insulation, inside hollow doors, and in wood that has been softened by a moisture condition. Why Is It So Difficult to Find Nesting Sites? Their nest is usually hidden in a wall void and since no one has “x-ray” vision, finding a nesting site can be most difficult and frustrating. Although some carpenter ant workers are active during the day, most activity is at night from dusk till dawn, with peak activity between 10 PM and 2 AM. It is sometimes helpful to take a flashlight and go exploring around your house on a warm evening after 10:00 PM. Look for and follow the trailing ants. They may lead you to a nesting site. How Extensive Is the Damage to the Wood? The extent and potential damage to a home depends on how many nests are actually present within the structure, and how long the infestation has been active. Frequently, most of the damage is caused by wood rot due to an excessive moisture condition, not the carpenter ants. Although large carpenter ant colonies are capable of causing structural damage, the damage is not normally as serious as that from termites. In some cases, the damage may be relatively insignificant, but this can only be determined by locating and exposing the nest area. We never had them before. Why do we have them now? Carpenter ants seen in the home especially from April through June may actually be nesting outdoors and are just foraging inside in search of the resources they need. Carpenter ants are known to travel up to 100 yards, even from neighboring properties, in search of food, moisture, warmth, and shelter. Carpenter ant activity may also be evident after a tree has been cut down or damaged as a result of a storm. They reach your home by following power lines, phone cables, fences, decks, trees that overhang or touch your house, or by simply climbing up the side of your house. The critical factor is whether you see carpenter ants inside your home during the colder months. When carpenter ants are found in the house from December through March it is usually a good indication that the source of the problem is inside or very close to the house. Eliminate the conditions that attract ants and allow them access to your house. Here are some things to look for and do around your home. The best way to control carpenter ants is to locate and destroy the parent and satellite nests using liquid sprays, pressurized aerosols, dusts, and baits. Before using any pesticide product please read, understand, and follow the directions on the label. If the nest is located and exposed (due to remodeling or re-roofing) almost any liquid or pressurized aerosol product sprayed directly on the ants will kill the nest. If the nesting sites cannot be located then carpenter ant control strategy involves one or a combination of these techniques: exterior perimeter treatment, void treatment, spot treatment, and baiting. 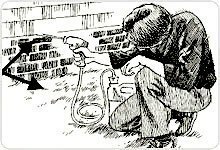 Exterior Perimeter Treatment: Apply a liquid spray product in a band about two feet out and two feet up on the foundation wall. Treat where the ground meets the foundation wall and up under the lower edge of the siding. Insecticide dust can be applied into deep cracks and crevices and voids that you find around the exterior. Interior Void Treatment: If you suspect a carpenter ant nest is in a wall or other hollow space you can inject an insecticide dust or pressurized aerosol into the space. Often times you can take advantage of natural openings such as around electrical outlets, phone lines, and ducts. Note: always use extreme care around electrical wiring and take all necessary steps to avoid accidental electric shocks. Where no natural opening exists, you may need to drill a small hole (1/8. to 1/4.) and then inject the material through the hole into the void space. Spot Treatment: Liquid spray may be applied to specific areas where carpenter ants are found foraging and trailing inside your home to help reduce the annoyance caused by their presence. Baiting: If the nest site cannot be located, using a bait may be an effective alternative. Baits work by combining an attractive food source with a slow-acting intoxicant. Place the bait only in areas where activity has been seen or is strongly suspected. After offering the bait, monitor it over 24 hours for feeding activity. Any bait that is ignored should be substituted with another, and any that is consumed should be replenished. Remember that increased ant activity around baits is a good sign. Never apply insecticides on or around baits because this will prevent feeding and render baits useless. Be patient – baits can take several weeks or longer to achieve control. Baits may be used inside or outside the house.